Commito, Mike. "Reggie Leach". The Canadian Encyclopedia, 17 May 2017, Historica Canada. https://www.thecanadianencyclopedia.ca/en/article/reggie-leach. Accessed 24 April 2019. Reginald Joseph Leach, hockey player (born 23 April 1950 in Winnipeg, MB). Known as the “Riverton Rifle,” Leach is widely regarded as one of the premier goal scorers in the National Hockey League (NHL) during the 1970s. Reginald Joseph Leach, hockey player (born 23 April 1950 in Winnipeg, MB). Known as the “Riverton Rifle,” Leach is widely regarded as one of the premier goal scorers in the National Hockey League (NHL) during the 1970s. As a member of the Philadelphia Flyers, Leach won the Stanley Cup in 1975. The following season, he won the league goal-scoring title with 61 goals and added 19 more in the post-season. Although the Flyers missed the Stanley Cup, Leach was awarded the Conn Smythe Trophy as the most valuable player in the playoffs. He is the only skater (non-goaltender) to earn that distinction as a member of the losing team. Leach played 934 games in the NHL, registering 381 goals and 285 assists. He shares all-time league records for most goals scored in a single playoff game and most goals scored in a single post-season. 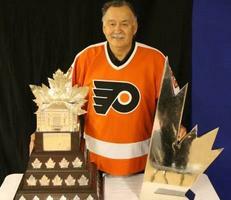 Reggie Leach was born on 23 April 1950 in Winnipeg, Manitoba. His mother, Jessie Ackabee, was from Eagle Lake First Nation, an Ojibwa community in northwestern Ontario. His father, Archie Leach, was a blaster whose younger sister lived with Jessie in a rooming house in Winnipeg. Shortly after Reggie was born, his mother made the difficult decision to send him to live with his paternal grandparents, 128 km north in Riverton. Although Archie was sending money to help care for the baby, Jessie was struggling to make ends meet and wanted a better life for her son. Reggie arrived at Reginald and Kate Leach’s home at only a few weeks old and increased the Leach brood to 13. Early on, it was clear that Leach was a talented hockey player. By the time he was 14 years old, he had already represented Riverton at the Bantam, Midget and Juvenile levels. Although he was quite young to play senior hockey, Leach also laced up his skates to play for the Riverton Lions, the local senior team. In 1965–66, Leach played for a Junior B team in Lashburn, Saskatchewan. Midway through the season, he grew homesick and, after returning to Riverton for the Christmas holidays, decided not to return. He played out the rest of the season with his old teams in Riverton. In his inaugural season with the Bombers (1966–67), Leach scored 67 goals and 46 assists as the team cruised to a 42–6–0 record and won the Manitoba Junior Hockey League title. The following season, the Bombers moved into the Western Canadian Junior Hockey League (now the Western Hockey League), and he and Clarke continued their torrid scoring pace. Clarke finished first in points, and Leach set a league goal-scoring record of 87 goals. The next year (1968–69), Leach continued to impress, scoring 36 goals in his first 21 games. Unfortunately, he separated his shoulder and broke his collarbone early in the year and was sidelined for the remainder of the regular season, but he returned to action in the playoffs to help the Bombers clinch the league title. Leach finished his junior career with the Bombers in 1970, with 255 regular-season goals and 146 assists. He ranks third all-time in the Western Hockey League in terms of playoff goals (41). In 1970, the Boston Bruins selected Leach third overall in the NHL amateur draft. While Leach made the Bruins team out of training camp, the club was loaded with talent and he found himself on the bench more often than on the ice. As a result, the team sent Leach to the Bruins’ Central Hockey League affiliate, the Oklahoma City Blazers, so that he could play more regularly. He was called back up to the big club in mid-January 1971 after an injury sidelined John McKenzie. Even after McKenzie returned, the Bruins opted to keep Leach in the NHL rather than send him back to Oklahoma City. The following season (1971–72), Leach found himself on the bench once again. After expressing his frustrations to his coach, he was dealt to the California Golden Seals — along with Bobby Stewart and Rick Smith — just before the close of the 1972 NHL trade deadline. While Leach gained more ice time in northern California, the Seals were not a competitive team and usually found themselves on the wrong side of the box score. At the end of the 1973–74 season, Leach received word that he had been traded to the 1974 Stanley Cup champions, the Philadelphia Flyers, where his good friend Clarke played. Leach, Clarke and Billy Barber formed the formidable “LCB Line” (derived from the first letter of their respective surnames), wreaking havoc on teams across the league. In his first season with the Flyers, Leach scored 45 goals, nearly twice what he had scored with the Golden Seals the previous season. The Flyers won the Patrick Division that year and went into the 1975 playoffs prepared to defend their championship title. After a hard-fought seven-game series against the Islanders in the Semifinals, the Flyers beat the Sabres in the Final and Leach achieved his childhood dream of winning the Stanley Cup. The Flyers made it to the Stanley Cup Final in 1976 but were unable to capture a third straight championship and were swept by the Montreal Canadiens. Despite the team’s loss, Leach equalled and set new NHL benchmarks throughout the 1976 post-season. On 6 May, he notched five goals in the deciding game against the Boston Bruins in the Conference Finals, tying the previous record shared by Newsy Lalonde (1919), Maurice Richard (1944) and Darryl Sittler (April 1976). Leach also set a new record for the longest consecutive goal-scoring streak in a single post-season, scoring in 10 straight contests. In total, Leach scored 19 goals in 16 playoff games. His impressive campaign earned him the Conn Smythe Trophy, an annual award presented to the most valuable player in the Stanley Cup Playoffs. Leach is the only skater (non-goaltender) in NHL history to win the award as a member of the losing team. His 19 post-season goals are still a league record (Jari Kurri of the Edmonton Oilers tied this record in 1985, scoring 19 goals in 18 games — two more games than Leach). Leach continued to rack up the goals for Philadelphia and was part of the longest undefeated streak in league history: 35 games (25 wins and 10 ties) from 14 October 1979 to 6 January 1980. He reached the 50-goal milestone again that season and added nine more goals in the playoffs. Philadelphia once again made it to the Final in 1980 but came up short against the New York Islanders, who captured their first of four straight championships. Leach played another two seasons in Philadelphia before he was released from his contract in 1982. During his time in the City of Brotherly Love, Leach racked up 306 goals and 208 assists. His career goal total with the Flyers ranks him seventh all-time in franchise history. Leach ended his NHL career with the Detroit Red Wings in the 1982–83 season. When he exited the league, his trophy case included a Stanley Cup, the Conn Smythe Trophy and two All-Star Game appearances (1976 and 1980). Although Leach knew his NHL career was over, he was not quite ready to hang up his skates. In the 1983–84 season, he played for the Montana Magic, a minor professional team in the Central Hockey League. In 1976, Leach was selected to represent Team Canada at the Canada Cup. While he did not dominate the scoreboard as he had with the Flyers that season (he scored one goal and assisted on another), Leach told author Mike Commito on 18 May 2016 that it was one of the greatest moments in his life: “Here I am, a little Native kid out of Manitoba, getting to play with the best players in Canada and playing against the best players in the world.” Canada played Czechoslovakia in the Final and clinched the gold medal before a home crowd in Montréal. While playing junior hockey and working in Flin Flon in the 1960s, Leach met Isabel Hunter. The two had a son, Jamie, and a daughter, Brandie. Jamie followed in his father’s footsteps and played parts of five seasons in the NHL, winning a Stanley Cup with the Pittsburgh Penguins in 1992. They are the only First Nation father-and-son duo to have their names engraved on the Stanley Cup. Brandie also excelled in athletics and made the Canadian women’s lacrosse team, playing in the World Cup in 1993. Toward the end of his professional hockey career, Leach battled alcoholism, often at the expense of his personal and professional life. After his marriage to Hunter failed, Leach checked himself into rehab in 1985 and has been sober ever since. Leach now lives in Aundeck Omni Kaning First Nation on Manitoulin Island in northern Ontario with his wife, Dawn. In 2006, Leach opened the Shoot to Score Hockey School with his son, Jamie. The school runs hockey development camps in different communities across the country. Leach prides himself on using the lessons he learned — both in hockey and life — to make a difference in the lives of the children he meets through the school. As Leach told Commito in May 2016, “I am more proud of what I did after hockey. It was just a stepping stone for what the Creator wanted me to do after.” Leach and his son reach more than 2,000 children every year, and he is very proud of the way they run their schools and the work they do with First Nations communities. Leach was inducted into the Manitoba Sports Hall of Fame in 1997. In 2008, he was one of the recipients of the National Aboriginal Achievement Award for his athletic career and, more importantly, for the work he does with First Nations youth. On 7 July 2016, he received the Order of Manitoba. Some believe that Leach’s resumé and personal story merit his inclusion in the Hockey Hall of Fame. He has been the subject of many petitions advocating for his induction, including a song by Canadian musician John K. Samson, former front man for the Weakerthans. Whether or not Leach is inducted, he will always be regarded as one of the premier snipers of his day and one of the best Indigenous players to have ever suited up in the NHL.